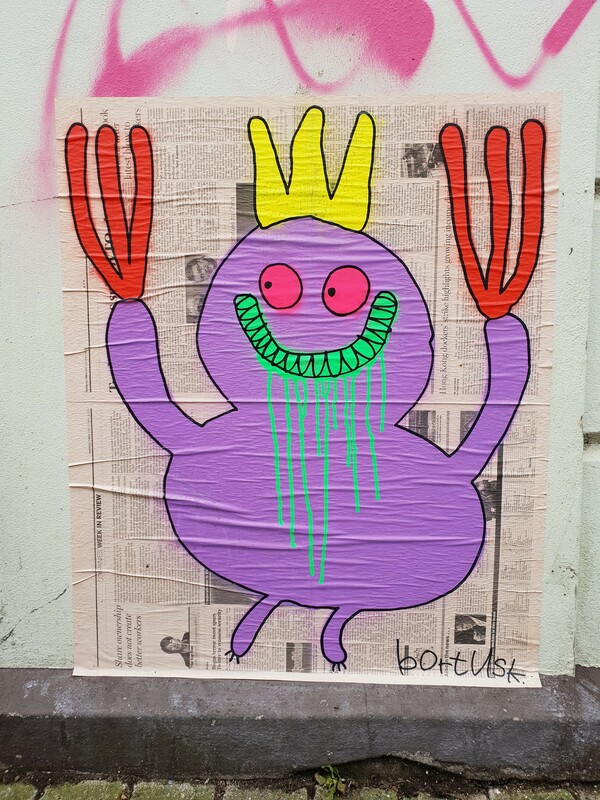 Bortusk Leer (to show off his full name) is originally from Slovenia, but now lives and works in Amsterdam where he creates his very colourful work. 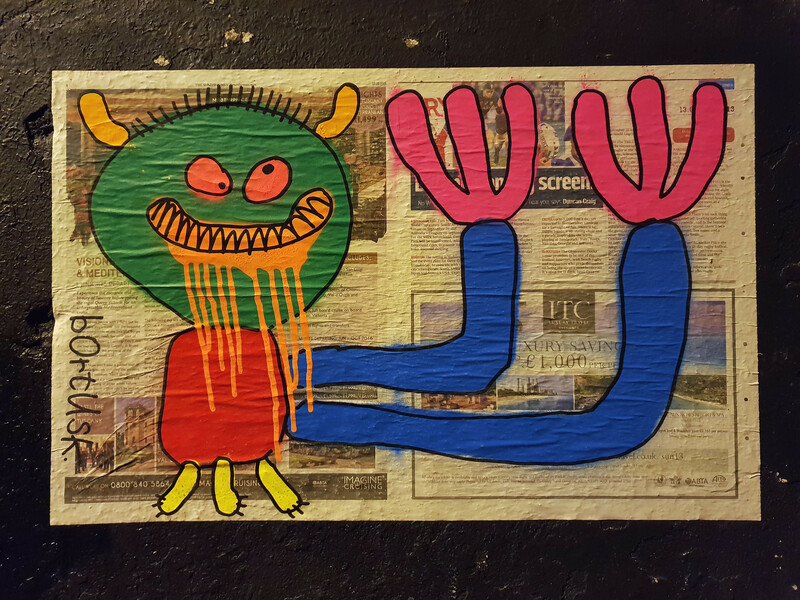 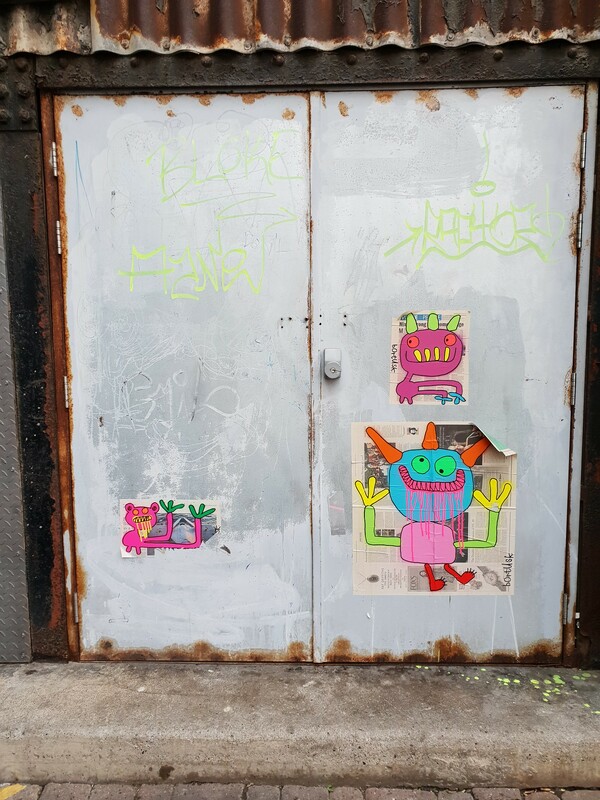 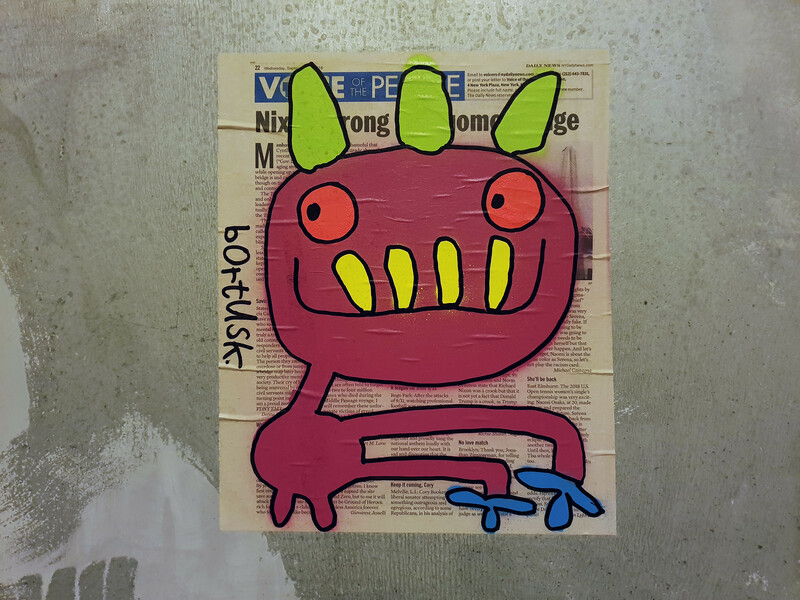 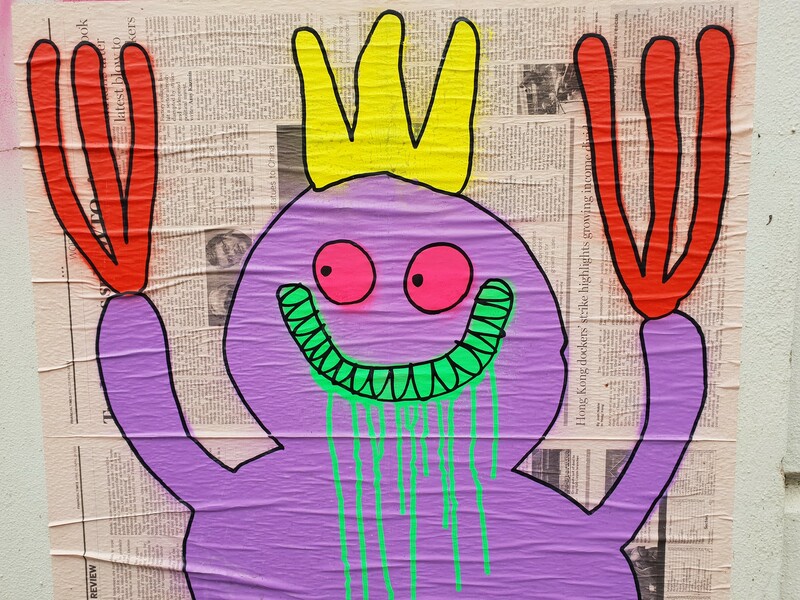 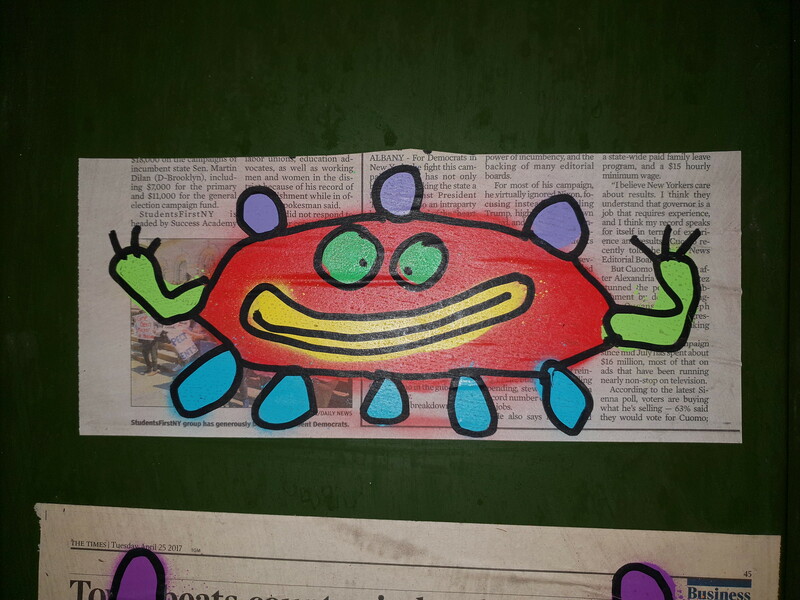 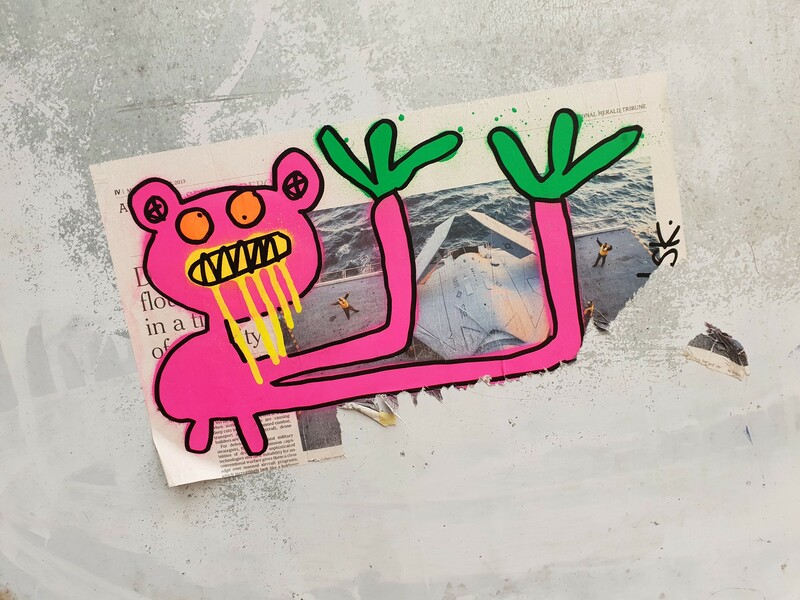 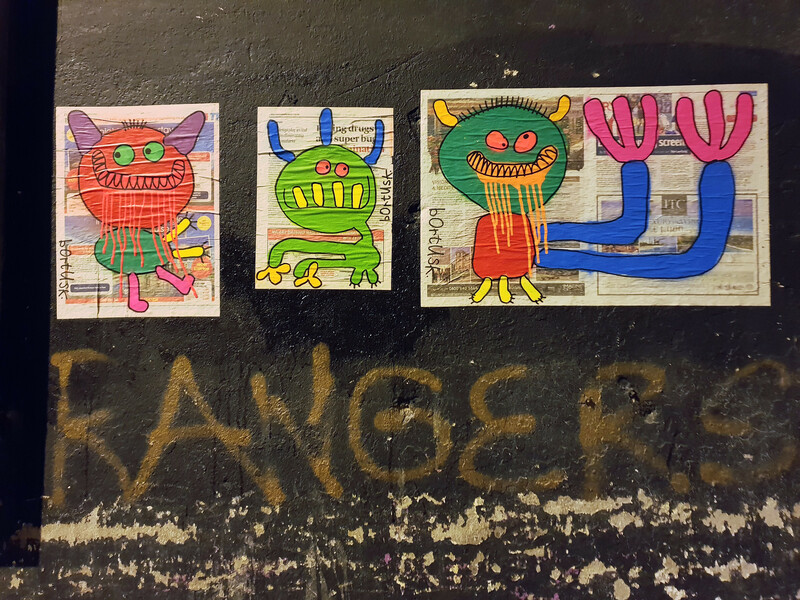 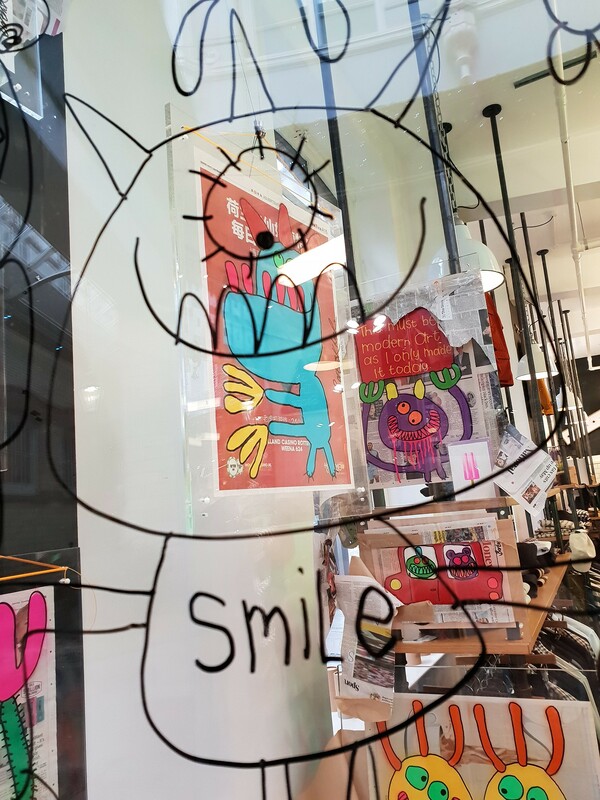 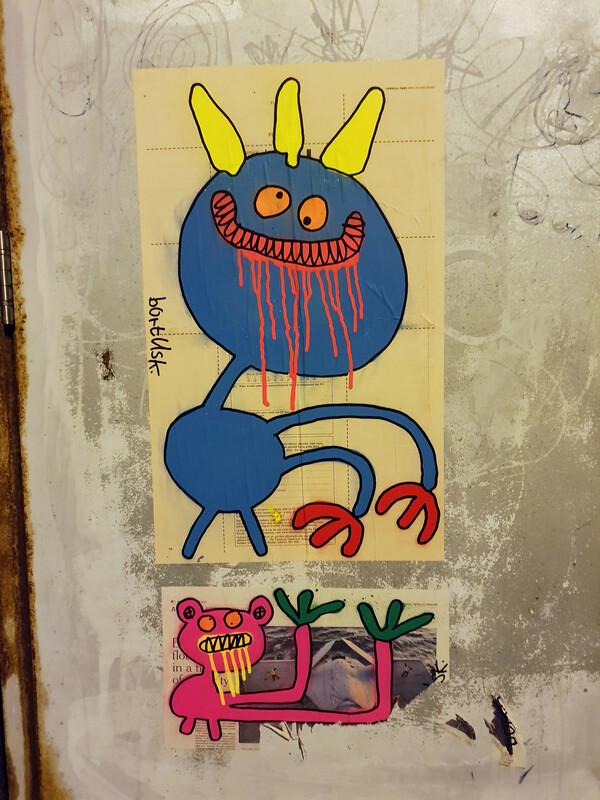 He can mostly be found painting bright coloured monsters on ageing newspaper – where the artist’s work can be summed up as happy, childish, neon and all a bit silly! 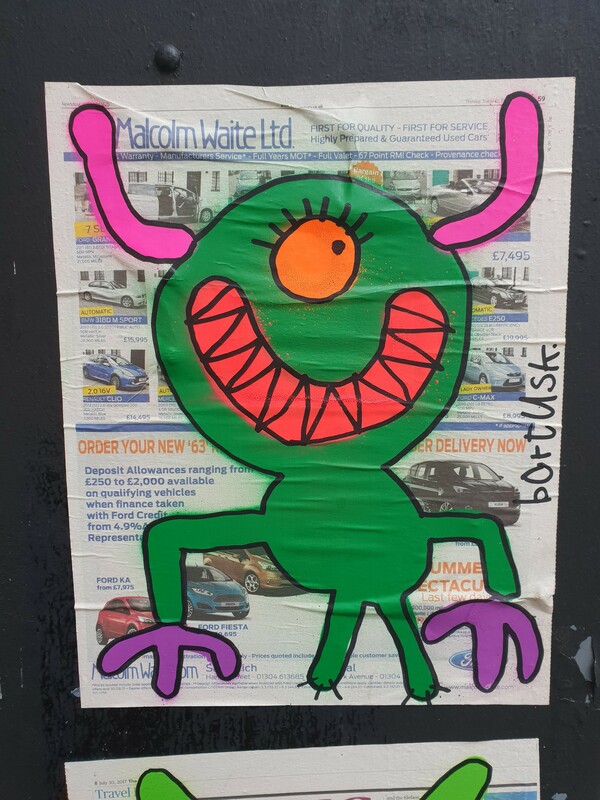 Having seen his iconic work numerous times around the streets of London it was by the off chance that something bright caught my eye whilst walking through St Mary Street in the city of Cardiff. 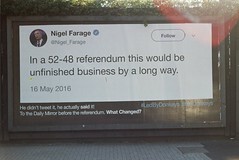 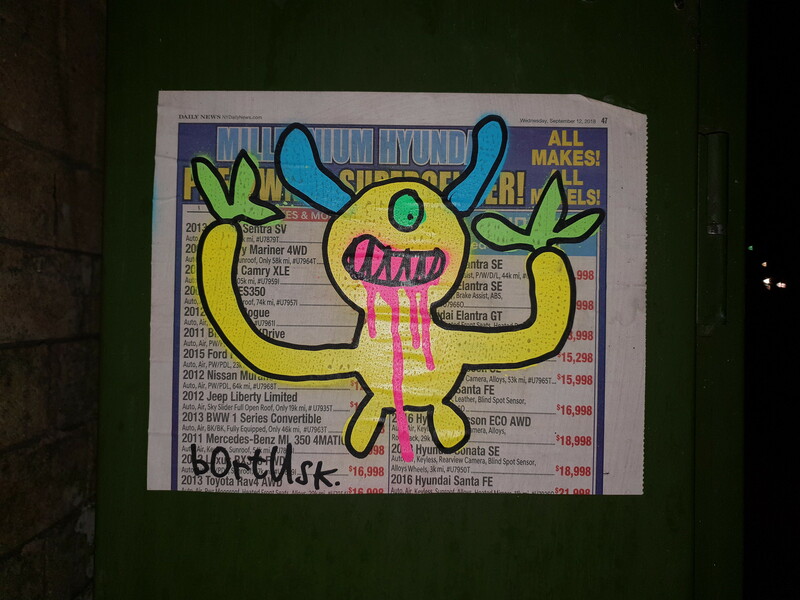 On closer inspection there were two posters by Bortusk on a facility box just a stone’s throw away from the Principality Stadium. 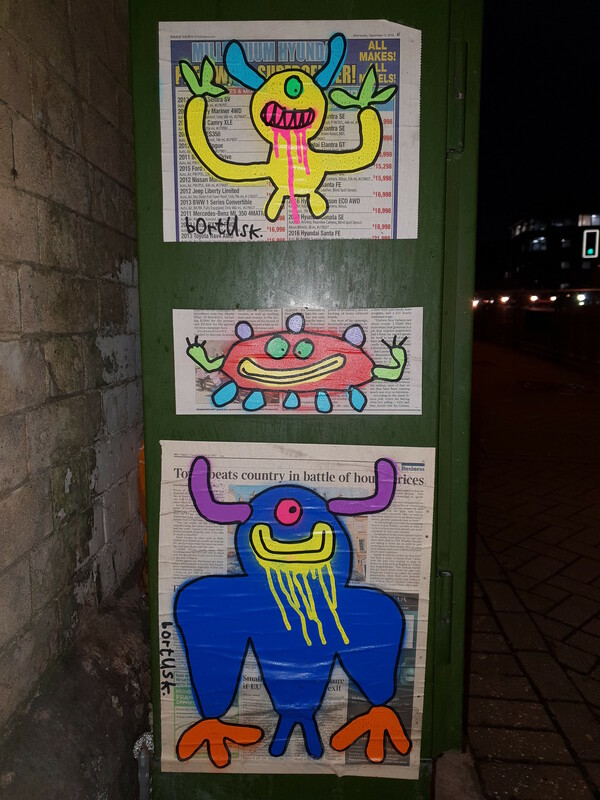 A quick bit of research on Instagram revealed that the artist was in town and it looked like his crazy creations were popping up all around the city centre. 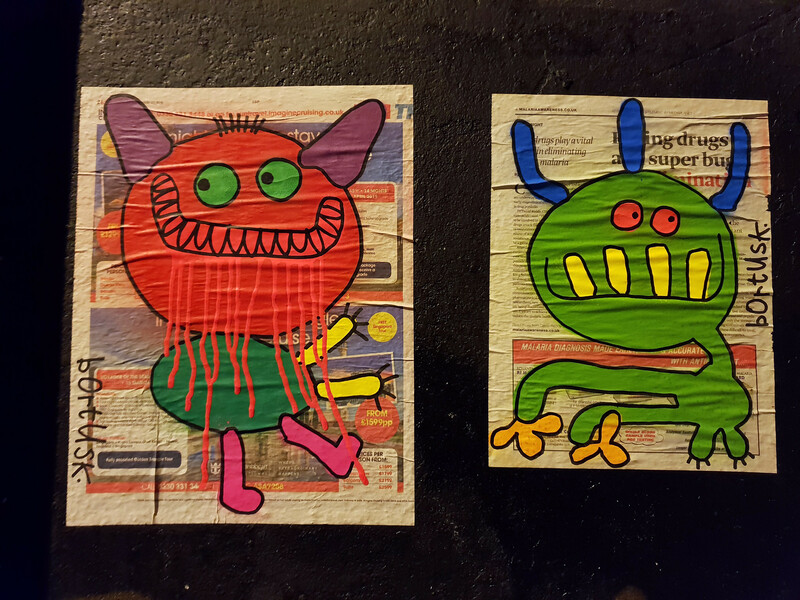 Thankfully the artist posted some pics on his Instagram as within a few hours of them being pasted up they had already been removed. 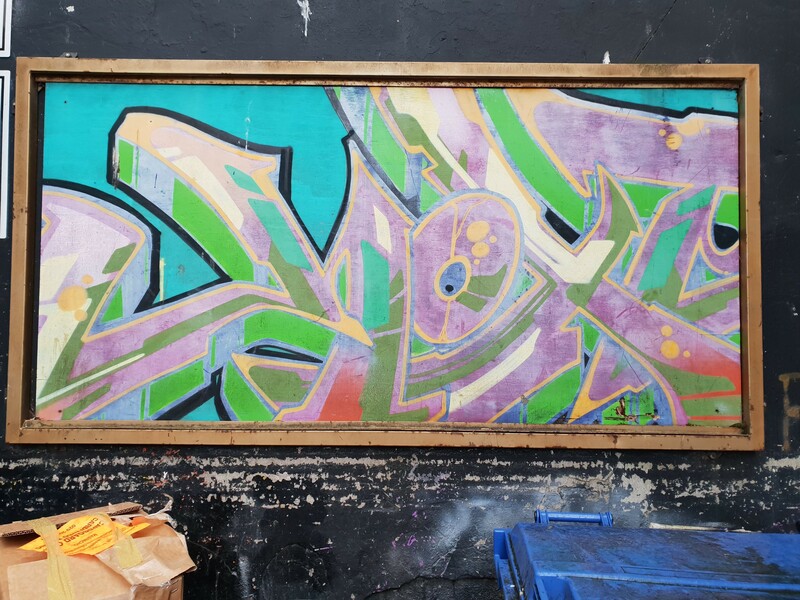 The artist has toured around the world visiting places like Milan, Brooklyn and Buenos Aires over the last ten years and has been making his art since 2007 and shows no sign of stopping – his next stop… Cardiff! 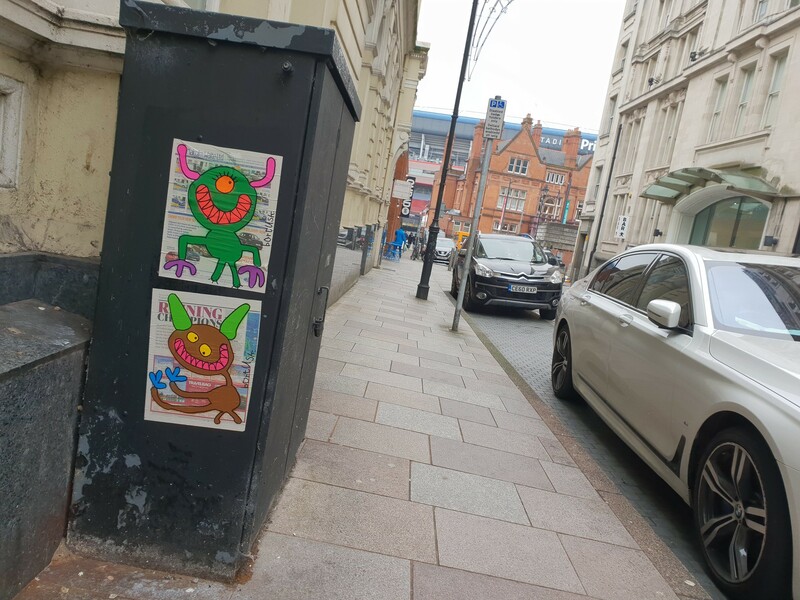 Recognising the background imagery from some of his snaps on Instagram a beeline was made to circle the Callaghan Square area to try and unearth some more of these colourful creatures. 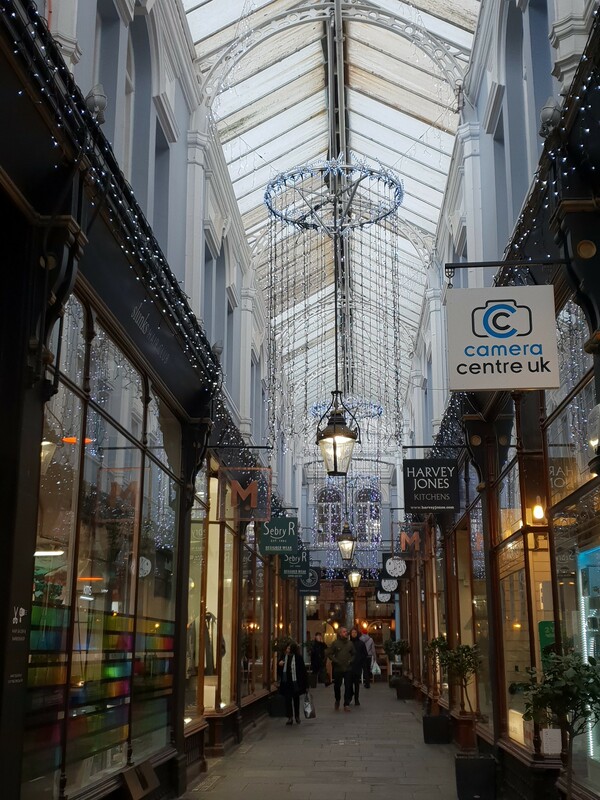 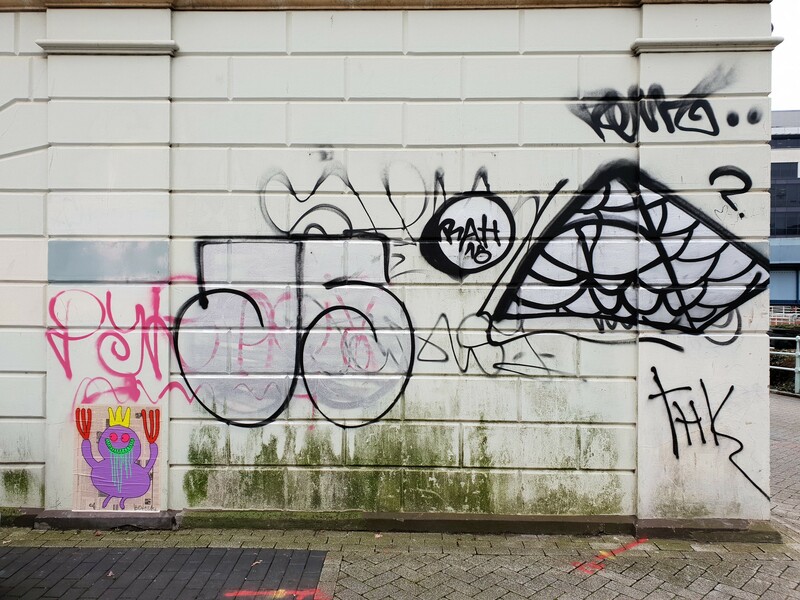 So it was great to see such a well known worldwide artist descend on the Welsh capital – but what was the real reason for his visit? 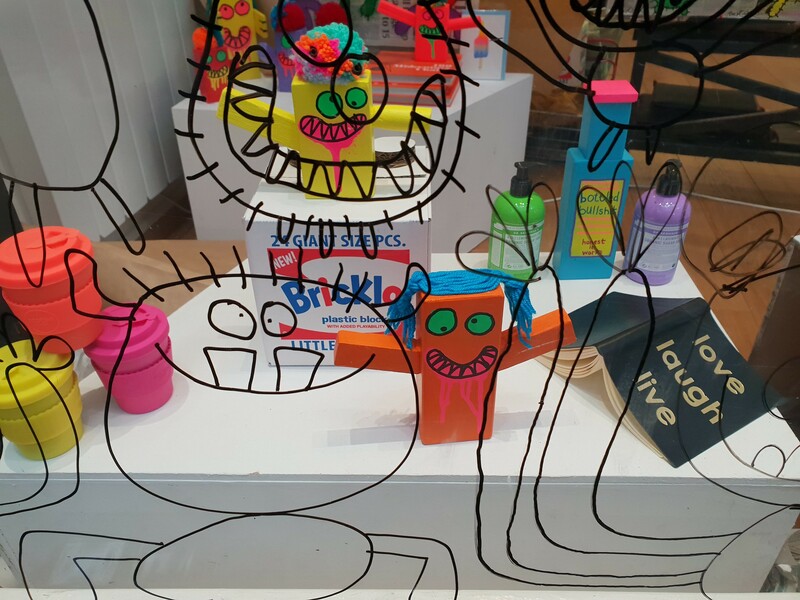 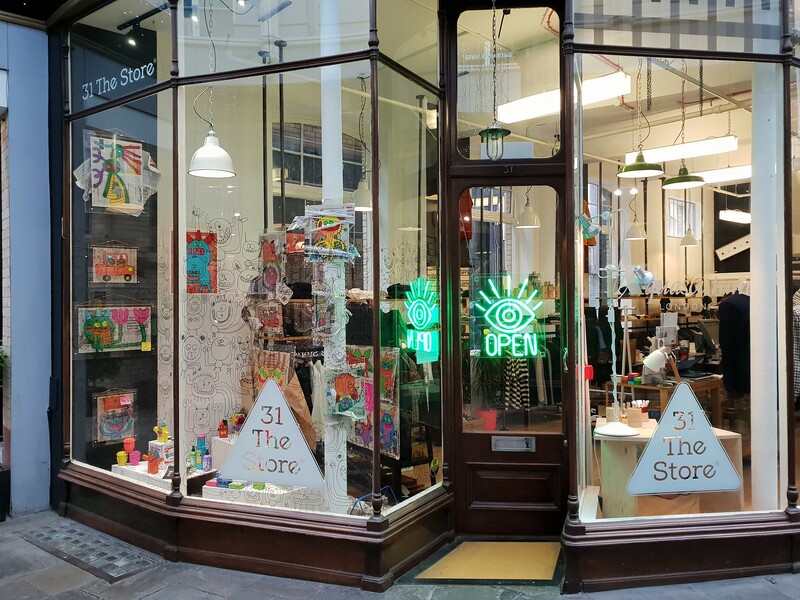 He had been commissioned to help decorate the shop interior aswell as a display on the windows. 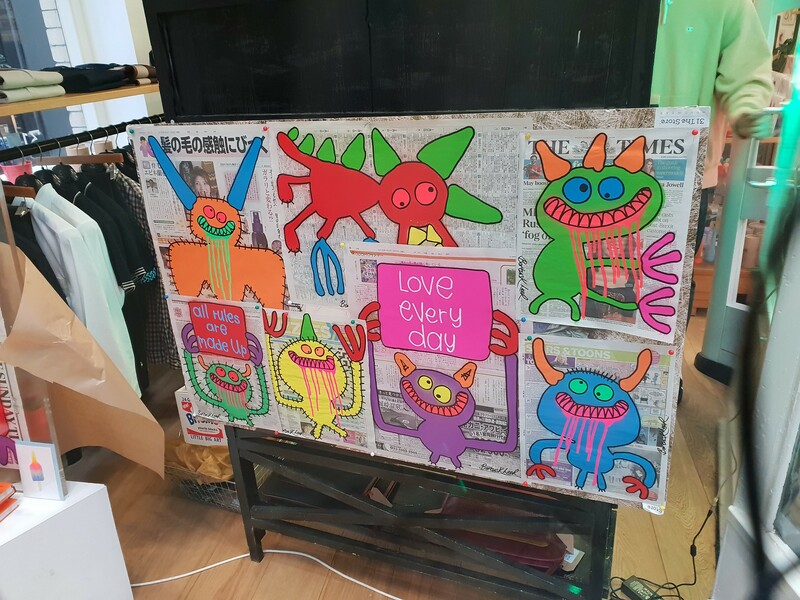 His colourful posters are for sale within the shop whilst black marker outlines of his characters adorn the shop windows but dont prevent seeing what else is inside. 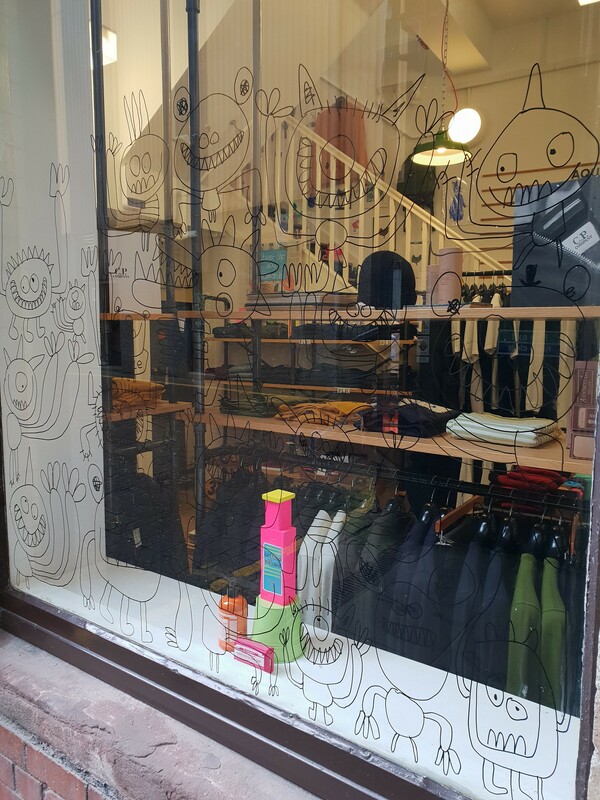 Not only did he decorate the shop but also a wall and a doorway alongside the shop on Baker’s Row. 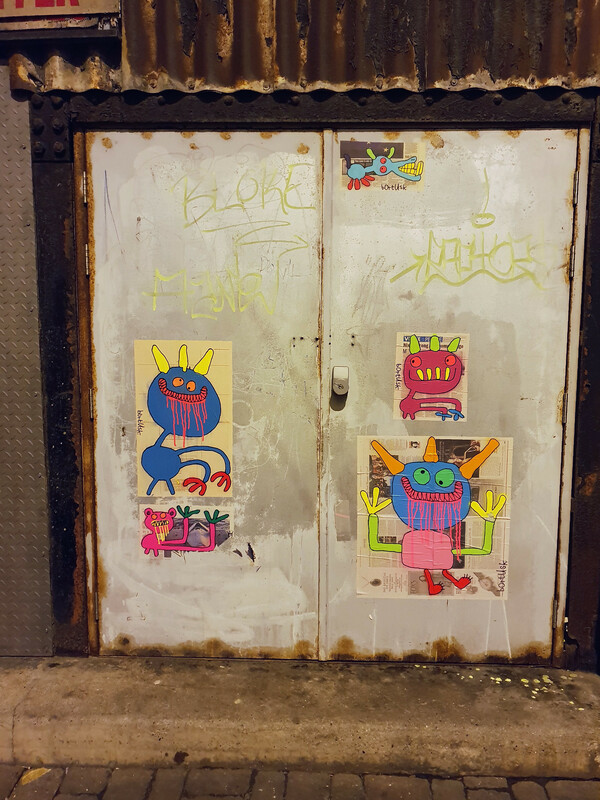 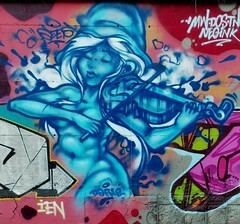 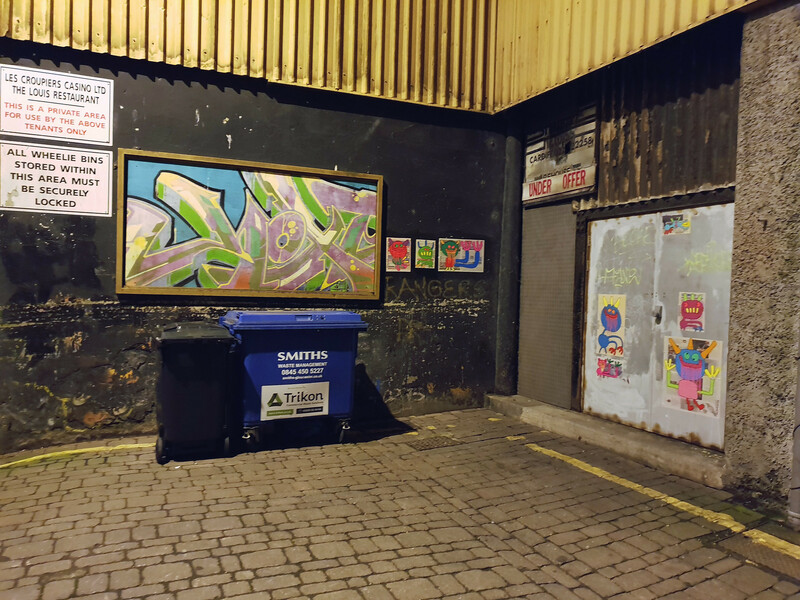 A late night ramble down this deserted street revealed a further selection of his work. 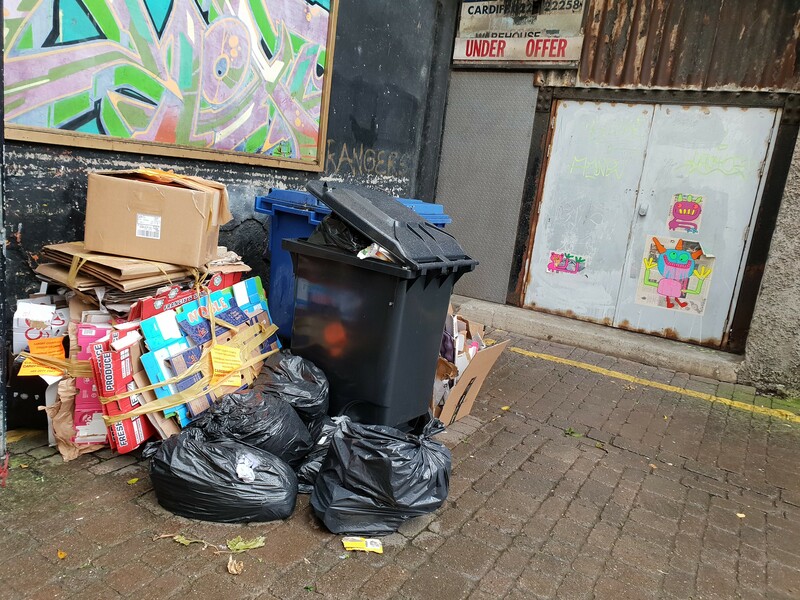 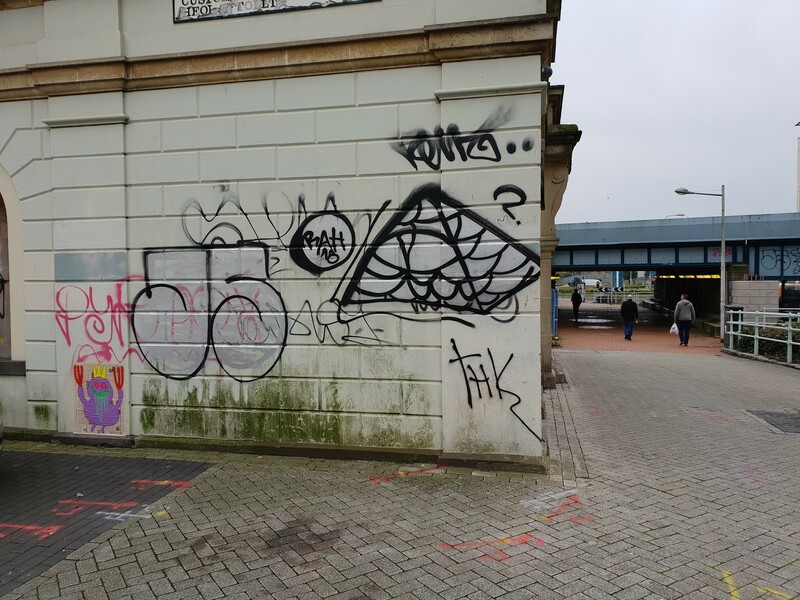 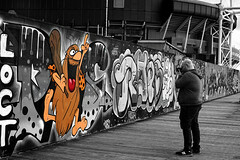 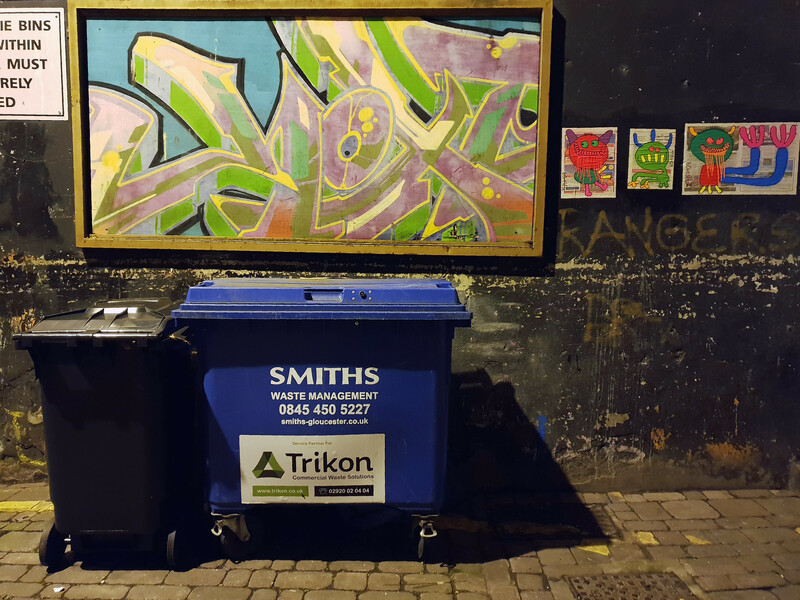 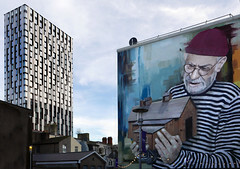 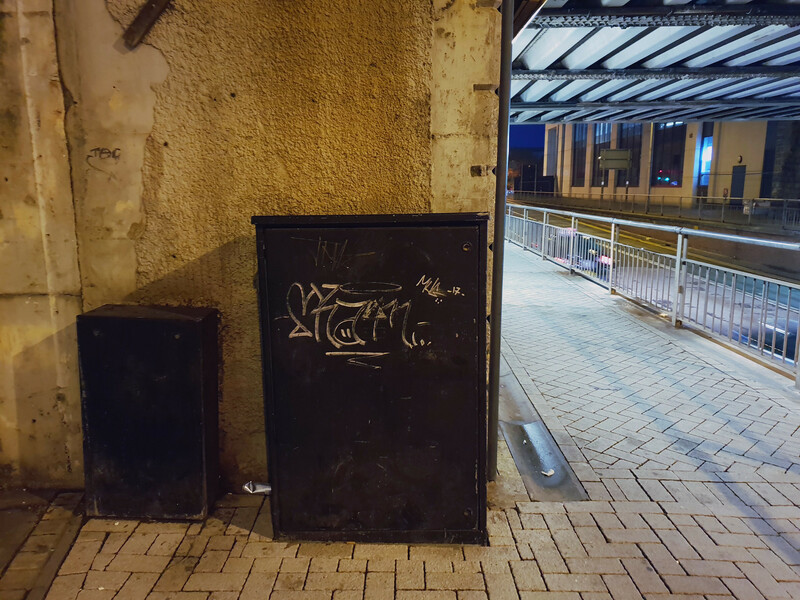 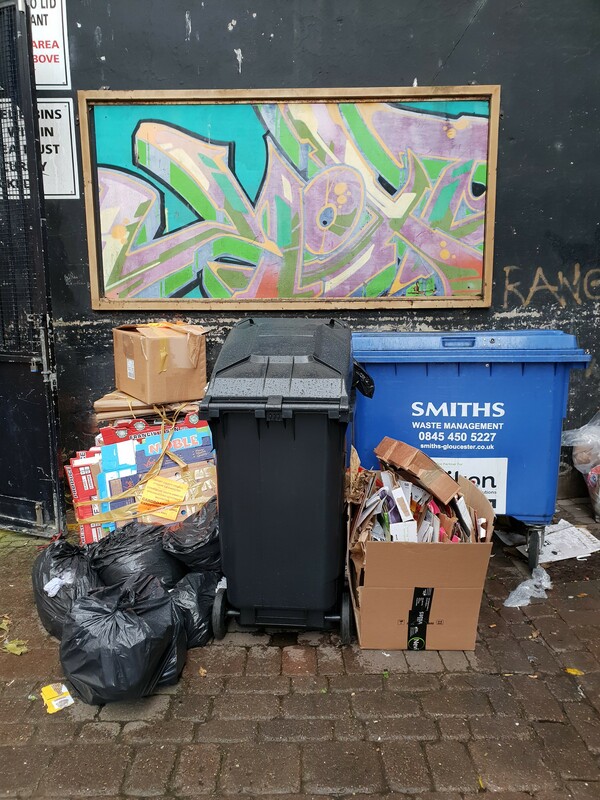 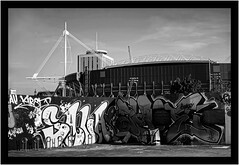 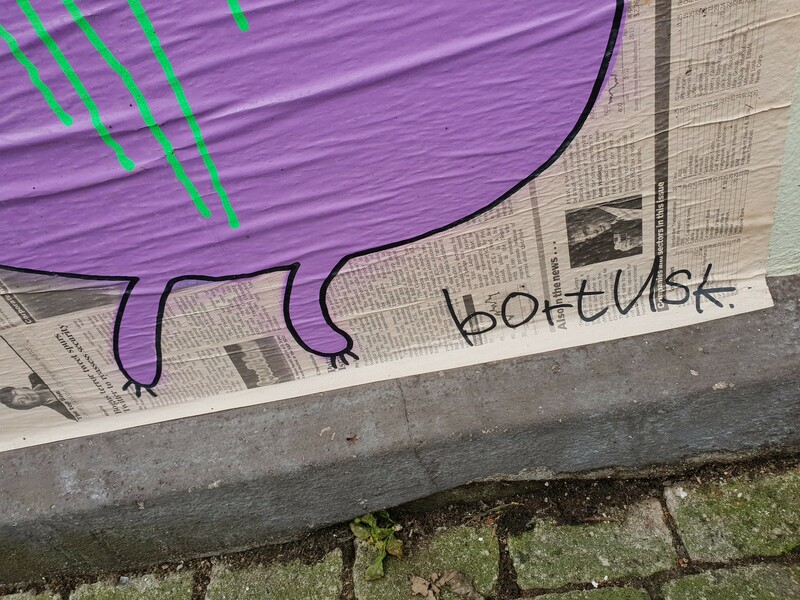 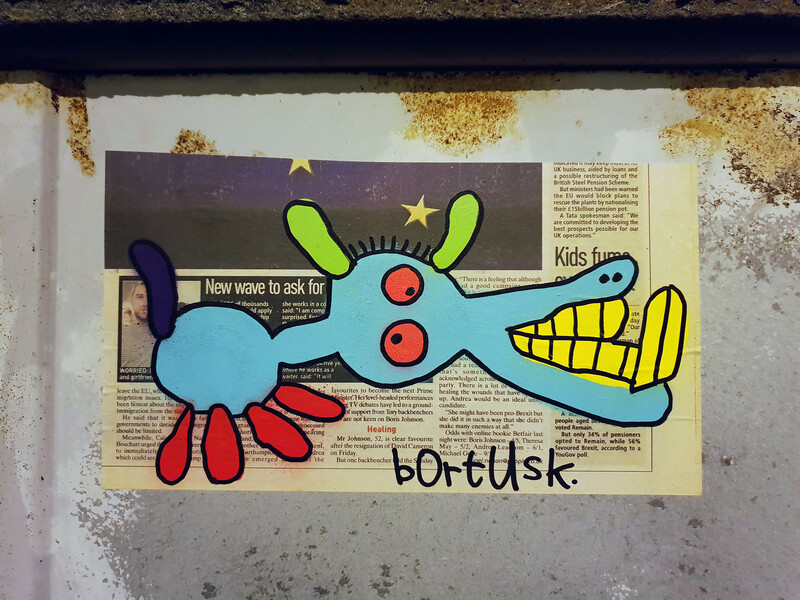 Whilst some artists work briefly grace the city’s walls here Bortusk’s work lies alongside one of the oldest remaining pieces of street art from Cardiff based artist Hoxe. 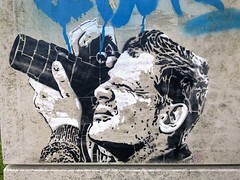 Next Post Buoys to Men!